Pleasant. By sad circumstance, the limes I bought were as dry as lima beans, so I had to supplement the citrus juice with white vinegar, which I believe is probably authentic but not as delicious. I'll make it again with only citrus juice. I had never had ropa vieja before attempting this, so I'm no expert, but my verdict is that this recipe only works well with a little bit of tweaking. I used 2lb of steak and liked the technique of boiling the beef, especially the flavorful stock it produces, which I also used to make the black beans and rice from this book. I wish an amount of salt had been specified, but I just rubbed my steak pretty thickly with salt and covered it with water till it was almost completely submerged. I cooked down the tomato/bell pepper sauce as directed but found that, once the shredded steak was mixed in, the mixture was much too dry (even though I used a half pound less steak than directed). To be fair, maybe this is how ropa vieja is supposed to be, but it seemed way too dry to try to simmer. I threw in some of the beef stock and a dollop of tomato paste to compensate, plus a ton more salt, as the sauce was tasting bland. This worked and produced a tasty result. The leftovers improved greatly. OK, here's how I changed this recipe: My husband's not doing dairy at the moment, so I omitted the milk. I always try to healthify recipes by adding some veggies, so I added cut cabbage. I didn't have enough tomatoes to make them a main ingredient, so I just used meager leftovers from an earlier dish. The resulting dish was */fabulous/*, and I will be making it next for a dinner party celebrating the resumption of diplomatic relations with Cuba, accompanied by the avocado & [ineapple salad from this same cookbook. I made this as a side for the ropa vieja, also from this book. This worked out nicely because I was able to use the leftover beef stock from the ropa vieja in place of some water in this recipe. I used half beef stock and half water for the cooking liquid, just because I was afraid the stock would be overly salty if I used it all. I also used canned black beans, and added all the liquid from the can. The stock added a nice touch to this rice, but even with that extra boost of savory flavor, the result was still pretty bland. I wish a salt quantity would be specified in this recipe, because it's difficult to salt "to taste" before the rice has cooked. We jazzed this up with some lime juice, hot sauce, and of course a bit more salt, all of which made it a perfectly delicious side dish. The leftovers have also greatly improved and reheated really nicely, but I'm still giving this recipe 3.5 stars since I had to do a bit of tinkering to make this taste great. Dry sherry and a room temperature beer at the end. This is my first use of this cookbook--I had a pound of green beans languishing in the fridge, and I happened upon this recipe just in time to make it for dinner. We are generally not a fan of overcooked veggies, so although the author said to boil the green beans for 7-10 minutes, I felt this might be too long and boiled them for about 6 minutes. Well, the author is right and I'm wrong, and I think this salad definitely works better when the green beans are nice and soft and can really absorb the dressing. Next time I'll follow instructions! I decreased the amount of red wine vinegar in the dressing slightly, and the beans are still plenty tangy, so I think that was a good choice. Marinated for an hour these green beans were okay, but I'm having some for lunch today and they definitely improved overnight. They're quite potent, but I think they'd make a nice addition to some sort of grain bowl to give it some oomph. On their own, I'm not sure how many I'd want to eat at once. Easy, fresh and a tasty combination of flavors. We didn't find anywhere near 1/2c oil necessary to dress this--more like 1/4c, if that. This made a great side for quesadillas. 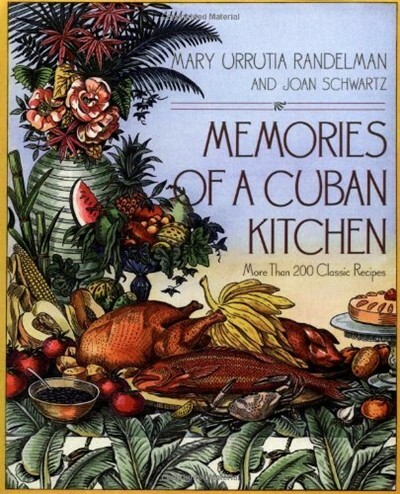 A native-born Cuban, Mary Urrutia Randelman has collected more than 200 classic recipes, fragrant and aromatic with traditional spices and herbs, vibrant with the colours of the tropics, and true to the cuisine, sensible and easy to prepare. Overlaid with reminiscences and black-and-white photographs of Randelman's childhood in Cuba, "Memories of a Cuban Kitchen" presents a luscious picture of the cuisine, a fusion of Spanish, Indian, African, Chinese, and Portuguese influences. Starting with explanations of unusual Cuban ingredients, Randelman moves on to the best-known appetizers and snacks like Green Plantain Chips and Black Bean Soup, and then the classic main courses like "Ropa Vieja", which translates to Old Clothes, but is a delicious steak hash in tomato sauce, or Roast Leg of Pork Creole and Grilled Fish Steaks with Vinaigrette, Moros y Christianos, also known as Black Beans and Rice, and Chick Peas with Chorizo are just a couple of the most popular Cuban combinations included, as well as desserts, ranging from flans, puddings, and custards to Crispy Coconut and Baked Ice Cream and the tropical dark rum-based drinks like Havana Beach and Flying Tiger are there too.